Here are a listing of tools lenders might find useful. All software is presented as is, with no implied warranty/liability. Use at your own risk. Once you install GreaseMonkey, you will need to close and then restart Firefox. Once this is done, open any of the files in the list below. 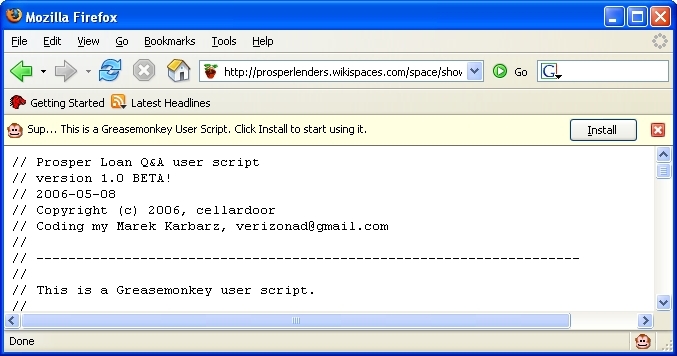 A bar will appear at the top of the screen, indicating that you've found a valid GreaseMonkey script. Note: GreaseMonkey is a very powerful tool. Be careful with the scripts you download/install. If you have any questions about the legitimacy of the script, confirm with author first. 04/15/2007: media:modifyunreadlink.user.txt - This script fires on the prospers.org/forum on the unread and unreadreplies page and updates the links to point to the new replies (http://prospers.org/forum/index.php?topic=1233.0). 04/15/2007: media:forumtopicpagelinkupdate.user.txt - This script fires on the prospers.org/forum and replaces the "Go Down" and "Go Up" link name to "Page Bottom" and "Page Top". 04/13/2007: media:linklendernamestolending.user.txt - This script fires on the listing page and replaces the lendername link in the bid history to the lender's lendingstat profile. 04/05/2007: media:ProsperThreadInserterAJAX.user.txt - This script fires on a listing page and pulls in links from Friedo's forum thread finder. Pings Friedo's site every time you view a listing. Updated by mr1776 to include Wiki link and work with Prosper's 04/03/2007 site changes. 4/05/2007: - media:ProsperListDetail.user.txt -This script adds back to the detail page the popular amount funded and time remaining. Click for a screeshot. Added my Retireme99. 04/03/2007: media:ProsperListingThreadFinder.user.txt - This script fires on a listing page to add static links to both the appropriate Wiki page and Friedo's forum thread finder. Updated by mr1776 to work with Prosper's 04/03/2007 site changes. 04/03/2007: media:loan_commenter_1_5.user.txt This script adds a Wiki "comment" page directly to the user, group, or listing page. - cellardoor, norcal_cct. - Updated by mr1776 to work after Prosper's major update on 04/03/2007. 02/16/2007: media:loan_commenter_1_4.user.txt This script adds a Wiki "comment" page directly to the user, group, or listing page. - cellardoor, norcal_cct. - Updated by Xenon481 to work after Prosper's major update on 02/11/2007. 06/20/2006: version 1.2, Adding in BarkerJr's fix for group page annotation, and adding in GPL. 12/11/2007 (Originally Added on 02/17/2007) : media:Prosper_XIRR_and_Loan_Age.xls - This Spreadsheet has two pages. Page #1 uses money transfer dates, current account value, and the value of late loans to calculate optimistic and pessimistic XIRRs. Page #2 uses loan origination dates and amounts to calculate the average age of a portfolio. - Created by Xenon481. Updated on 12/11/2007 to include Recovery and Debt Sale rates. 04/14/2007: To set up your own spreadsheet or read related information, you might check out message thread Calculating Return On Investment (annualized) using Excel XIRR. - Creaded by Mark12547. These scripts are older, and mostly relevant for the old wikispaces wiki. This page was last modified on 23 August 2010, at 15:37.